The department of Artigas in the northernmost region of Uruguay was named after national hero José Gervasio Artigas, who fought for the establishment of democracy in the country. Its proximity to Brazil makes Artigas vital to the flow of trade in and out of the country. Climate conditions in the department have also made it possible for the cultivation of important crops, such as rice, sugarcane, fruits and vegetables, as well as the raising of livestock. It is also a rich source of semi-precious stones, including agates and amethysts. The region’s urban centres include the department’s capital, Artigas City, as well as Bella Unión, Tomás Gomensoro, Baltasar Brum, Las Piedras, and Pintadito. Artigas City is situated in the basaltic Santa Ana Hills, lying along the Cuareim River just across from the small town of Quaraí in Brazil. Its fertile lands allow for the cultivation of cereal grains, sugarcane and fruits such as oranges and grapes, as well as for the grazing of cattle and sheep. Near the city there are extraction and manufacturing facilities for semi-precious stones. 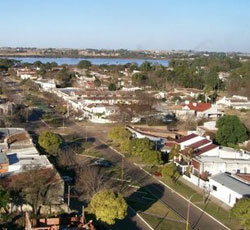 The city of Bella Unión in Artigas is situated near the point where the borders of Argentina, Brazil and Uruguay meet. It is considered the agro-industrial centre of the region. Because of its proximity to the Brazil municipality of Barra do Quaraí and the Argentinian city of Monte Caseros, Bella Unión is the site of active trading of agricultural products among the three nations.